Home Maat Philosophy Will We Ever Detect Ourselves In Parallel Universes? MATAHEKO, Ghana – Is there anything outside our Universe? Many physicists think it’s possible, says Marcus Woo, but could we one day know for sure? We think of our Universe as everything there ever was, is, and will be. But according to some researchers, there might not just be many universes, but an infinite number of them. This notion of multiple universes – sometimes dubbed the multiverse for short – isn’t some crazy idea concocted by bored physicists. While the science is undeniably speculative, they emerge from fairly well-grounded theories. And recent discoveries have made headlines for supporting the idea. There’s a lot that physicists don’t yet know, but the existence of the multiverse is possible, and some might say probable. Yet if there really were other realms outside our own, how would we even know? Will we ever be able to detect another universe? “I do think you can find smoking-gun evidence for things outside of [our Universe],” says Anthony Aguirre, a physicist at the University of California, Santa Cruz. After all, not being able to directly see or hold an atom didn’t preclude physicists from confirming their existence. Physicist Alan Guth proposed this radical idea in 1980 to explain several features of the Universe: why it looks the same in every direction, for instance. Since then, physicists such as Andre Linde have further developed the theory, which has been supported by observations of the cosmic microwave background (CMB) – the leftover glow of the Big Bang that fills the sky. A few weeks ago, physicists behind the Bicep2 experiment made headlines for detecting a strong signature of inflation – ripples in the spacetime fabric of the cosmos called gravitational waves. The pattern in the sky they saw was precisely what the inflation theorists predicted. What’s this got to do with the multiverse? No one knows exactly how inflation occurred, but some of the simplest, most reasonable ideas suggest that random quantum fluctuations in the early Universe caused inflation to stop in some regions but not in others. Inflation would thus be eternal. In places where inflation ceased, pocket universes would form, where atoms, stars, and even planets could assemble. Our Universe would be just be one of these myriad pocket universes. Although inflation is widely accepted, eternal inflation remains more speculative. “I’m personally skeptical of this story,” says physicist Sean Carroll of the California Institute of Technology. Still, he says, it is plausible. According to some theories, each pocket universe could take on the form of a bubble, producing a multiverse that’s like infinite foam, in which each bubble is a universe with its own versions of the laws of physics. And because the possibilities are literally endless, some universes would be alternate realities in which you’re a movie star or where dolphins rule the Earth. These bubble universes are all connected, but in between them, eternal inflation is still stretching spacetime faster than the speed of light. So unless you can move faster than light, which Einstein said was impossible, you can’t hop from one bubble to another. Maybe the safest and best way to see another bubble universe is if one happens to bump into our own, which Aguirre says could leave an imprint in the cosmic microwave background. How likely is such a scenario and what would this cosmic bruise look like? It depends on the true nature of inflation, he says, which is just something no one fully understands yet. Another possibility is that a nudge from a neighbouring universe would cause galaxies near the bump to move in a distinct direction compared to the rest of our Universe. Some astronomers claimed they’ve observed this so-called dark flow, but most scientists remain sceptical. “My sense is that it’s fairly unlikely,” Aguirre says. If another universe could induce a dark flow, it would’ve left a noticeable and telltale mark on the CMB, which astronomers simply haven’t seen. Other than cosmic bubble bumps and dark flows, he says, there aren’t many well-developed ideas as to how to detect other universes in the inflationary multiverse. Another type of multiverse arises from what’s called the Many Worlds interpretation of quantum physics. According to this theory, every possible outcome in the Universe exists simultaneously in other universes. For example, you can look and find that your desk lamp is on. But at the same time, there’s a separate, parallel reality where you find that the lamp is off. 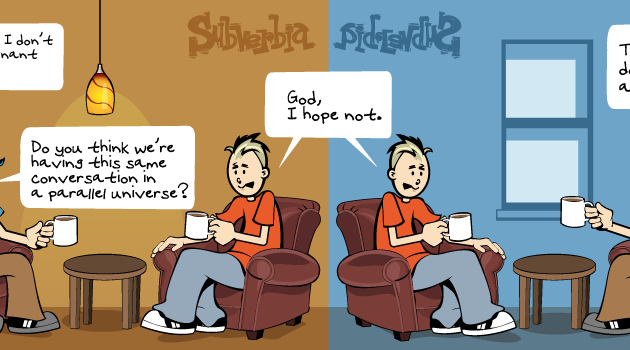 Like the inflationary multiverse, the Many Worlds multiverse implies alternate realities. One big difference, however, is that the parallel universes of the Many Worlds theory aren’t in any physical place, but instead coexist with ours in a separate, abstract part of reality. Scientists may simply never find direct signs of any kind of multiverse, Carroll says. For some naysayers, that means these theories are not scientific. But that misses the point, he says. “Our job as physicists is to believe what our equations tell us.” In other words, by pursuing the maths, theorists may help us discover indirect signs of the multiverse. And eventually, enough of this indirect evidence could have been assembled to suggest that the multiverse is overwhelmingly likely. Given the staggering implications that this would entail – an infinite number of close-copies of you and the Earth – it could well be a difficult thing for many people to accept. At least in our Universe.